This week Lisa chats with Dave Stachowiak. They focus on using your strengths to fuel your leadership journey. If you have ever compared yourself to someone else in the business world (which is probably most of us), or if you’ve had a career path that has zigged and zagged, then this podcast is for you. Dave is a consultant who works with top-level managers to build their leadership capabilities and amplify their strengths. So, tune into his examples and tips to improve your personal leadership skills as you listen. To find out more about Dave and listen to his Top 10 iTunes Careers Podcast, visit Coaching For Leaders. Lisa Cummings: [00:00:09] You’re listening to Lead Through Strengths, where you’ll learn to apply your greatest strengths at work. I’m your host, Lisa Cummings, and I’ve gotta tell ya, whether you’re leading a team or leading yourself, it’s hard to find something more energizing and productive than using your natural talents every day at work. [00:00:27] Today, you’ll get an episode filled with an exploration of leadership as a journey. You know how on social media you compare your everyday life with everyone else’s highlight reel? Well, I believe the same thing happens with careers. People compare themselves to successful leaders, and they forget that those successful people they’re looking at went through a process to get there, and often a long process. [00:00:52] Your guest today is a perfect picture that he has a windy career path from being in a junior police academy in high school, thinking he was going into law enforcement, all the way through working as an executive at Dale Carnegie. So, some very different twists and turns along the way, both in expectations and in achievements. [00:01:14] For those of you who worry that you can’t make huge career shifts or that you have to pick right now what you’re going to be for the rest of your life, it’s proof right there from our guest that you surely can change your mind. [00:02:08] I’ll tell you your guest today is one of the most humble guys you’ll ever meet, and he makes leadership success attainable. Today you’ll hear how you too can have a career path that does some zigging and zagging, and that you can have plenty of bumps in the road. Yet if you focus on your personal leadership journey over the long haul, you can really live a successful life. [00:02:33] So, Dave Stachowiak, welcome to the show. Dave Stachowiak: [00:02:37] Lisa, I’m so glad to be here. Thank you for the wonderful introduction, and it got me thinking that I had seven majors officially in college, too, so we can just throw that in there as far as a windy road things I’ve done in my life. Lisa Cummings: [00:02:49] Oh, that is such a good one, too. I just did a speech the other day for a university group and I was asking them what’s stressing them out right now about their careers, and that was it. They were like, “We have to pick not only the major, but we feel like this is the biggest decision of our life, because if picked the wrong one we set forward this decision that will create a ripple forever. And it feels like this is it. And if I pick wrong, I’m screwed.” So I think it’s a beautiful picture that, yeah, you can change your major, and you can change your career, and it all works out just fine. Dave Stachowiak: [00:03:18] Yeah, it seems so stressful at the time, and I remember just being so, I mean, it’s such a difficult time in my college years. I’m trying to figure out what I was going to do and what I was going to major in. And I look back now and I realize that because, ironically, I went through seven different majors and did all these different fields of study in school, I’m way better at my job than I would’ve been if I had focused in one area, because with my career in training and coaching, I work with all kinds of clients in all kinds of industries, and I know a little bit about a lot of different areas. And that’s turned out to be a huge benefit actually. So it’s kind of ironic. [00:03:58] Well, and there is the mark too, and I tell this to clients all the time, is you create your story. You tell the story of your career. If you let someone else tell the story of your career, and define it for you, then they’re going to define it however they’re going to define it, and it may or may not be the story you want told. And so, on a serious note, I really do think that we all need to think about what is our career story going to be, and how does our journey align with that, and the things that happen along the way. Lisa Cummings: [00:04:26] I think that’s the perfect setup for this concept of personal brand and how, when you and I have talked in the past, you’ve talked about how you made a conscious decision that your strengths would support your success, and that you were going to brand yourself around those. So let’s start off, since we do so much with StrengthsFinder and strengths-based development, let’s start off by just getting the listeners your top five Talent Themes, and then how you see them showing up on you at work, and then we’ll use those to segue into the story part. Dave Stachowiak: [00:04:58] Certainly. So my five themes are Futuristic, Relator, Intellection, Learner and Responsibility. And I’ve taken StrengthsFinder a few times over the years and they’ve always been fairly similar, maybe one difference, but as I look at those today they very much speak to me in the kinds of strengths that I feel like I’m better at than the others. Lisa Cummings: [00:05:18] Which one do you think resonates with you the most right now, that you see showing up on you all the time at work? Dave Stachowiak: [00:05:24] Relator is a big one right now because of the work that I’m doing both in my work at Dale Carnegie, and in my work running the Coaching for Leaders Academy, which is a membership organization that’s part of my listening community. It is really important and critical for me to develop really strong relationships with clients, and particularly clients who are part of our Academy, that I’m with for at least a year if not longer. [00:05:50] Those relationships really come down to how well do I relate to my clients, but in addition to that, and perhaps even more importantly, how well do they relate to each other. So I need to not only be really good at doing that myself, and thankfully that’s a strength, and so it’s something that I feel like I’m pretty good at, but I also need this to set the bar and expectation for modeling that for the entire membership community, and to encourage the members to be doing that for each other. And that’s the part for me that’s really exciting when I see that happen in a pretty substantial way. Lisa Cummings: [00:06:30] Yeah, I love how you made the double duty out of it, using it for yourself and then using it to model so others can see how the interactions can look. That’s really cool. Now, you seem pretty ninja with your awareness of your strengths and being able to use them the way you just described, but I’m pretty sure you didn’t start like that fresh out of school. [00:06:49] So take us back a little bit. Tell us about your career journey and how it has evolved, and how your strengths uncovered through that process. [00:07:21] I was really stressed, I was overwhelmed with time management, I was over-committed like a lot of people go through when they’re going through school. I started working with her, so I’ve always been conscious of the importance of investing in one’s self and recent awareness of one’s self. I took things like the NBTI and StrengthsFinder at the time, and by the time I was done with school and in the first few years of my career I’d probably taken Myers-Briggs half a dozen times and I’d taken other assessments. [00:07:49] One of the interesting things that happened to me that was, it’s a cautionary note for utilizing assessments, and you and I are big fan of assessments, Lisa, is that I took Myers-Briggs a bunch of times, and I always came out as an extrovert. And so I really thought of myself as an extrovert and I made career choices that an extrovert would make. I really tried to do the things that extroverted people I think should be doing. [00:08:16] It wasn’t until I went through certification myself on how to administer NBTI assessments that I discovered, in a pretty jolting way, that I wasn’t really an extrovert at all, because they can just give the assessment and take you through a whole series of exercises over a course of days and really did a lot of self-reflection. And it became apparent that my core strengths weren’t really as an extrovert but they were really much more aligned, and my preferences were much more aligned as an introvert. Lisa Cummings: [00:09:11] [laughs] There’s a lesson from the show right there. Just ask people around you. Sometimes they know a lot more than you do. [00:09:47] And it also sort of made sense, too, because I always felt like I was kind of a square peg in a round hole in the industry, and in my position, because it seemed like the things that came naturally to everyone else, like cold calling, and going and making lots of sales connections every day, those are things I really struggled with early on in my career. And I couldn’t figure out, “Why am I not good at this? What am I missing?” And it turned one of the big things I was missing is I had an incorrect view of myself from an assessment that didn’t come out accurately. It took some time to unpack that and really to realize also that whatever strength you bring, you can leverage. It’s just I wasn’t leveraging them at the time. Lisa Cummings: [00:10:32] Yeah, that’s really interesting. And now, looking back, thinking about the StrengthsFinder results, like some of your potential success factors, seeing a preference with your Intellection. People I meet with Intellection are usually totally fine being alone for long periods of time, and want to do the deep thinking, and so it doesn’t lend itself often to the kind of extroversion scale. It’s based on different things. It’s not personality typing – StrengthsFinder. But if I saw Relator and Intellection, I would not assume you were an extrovert. I would think you might like that smaller close circle of friends and some healthy dose of time by yourself. [00:11:10] So, that all sounds good from an academic level. So you figured that out. Great. But now let’s get back to the real part. You had to make cold calls, you had to do sales, and you had to deliver training and coaching to people. So you know this now. What did you do? Dave Stachowiak: [00:11:27] Well, I was so bad at my job the first year at Dale Carnegie that I went into our president’s office after the first year was complete, and I offered my resignation; that’s how bad it was. I mean, from a results standpoint, I got along well with everyone, people liked me. That wasn’t an issue, but it’s from a result standpoint I was not doing well. [00:12:14] And I started thinking about like what were the things I was already doing that I’d done successfully. So I had actually started writing an email newsletter a few years back even before I worked for Carnegie. And so I started thinking, “Well, what if I tapped into my talents more in writing? What if I did some more one-on-one coaching?” which we weren’t doing at the time, at least not in our office at Carnegie. [00:12:41] I ended up putting together a coaching program and doing one-on-one coaching. I ended up starting to do a lot of writing and doing things like, over time evolving that into things like webinars and doing more things online. And it turned out, not only was I pretty good at that, but a lot of other people in the organization weren’t, because we didn’t tend to attract people who were as good as writers or doing things one-on-one. We tended to be more of an extroverted business, and still are today. [00:13:06] In addition to that, being a really a fantastic listener. All of a sudden were things that people were connecting with, and I was doing it so differently than everyone else that it was very unusual. Within a year or so I’d really found a place where I was a lot more comfortable in my own skin, and I was doing it in a way that made sense to me, where I actually enjoyed putting things together versus when I tried to cold call on my first year was just kind of a disaster. [00:13:34] I remember this one day, Lisa. I built up all this momentum and I was like, “Okay, I’m going to go to this one office building. I’m going to knock on people’s doors, knock on businesses’ doors. And I went. I drove all the way up there. I drove up to Los Angeles, parked the car, had all my brochures, everything, and I walked in the building and I couldn’t do it, and I walked out back to the office. [00:13:59] I was like, “I’ve got to figure out a better way to do this, that is not so hard.” So that’s what I started doing. And today that has turned into so many wonderful talents and experience, now being able to leverage in so many different ways, and Coaching for Leaders in a lot of ways came out of that. Lisa Cummings: [00:14:16] What a good example of job shaping. I’m talking about this with people all the time in training sessions about how you think your job description is fixed, but you just gave a perfect example of how a sales job, then got turned into a one-on-one coaching job, but you reframed it and thought about how you could apply the talents you have to be awesome at it, and you were doing something innovative for the company in bringing them new business at the same time, and basically letting your hidden talents out of the closet. [00:14:44] Let’s say that a listener is experiencing what you were experiencing there where they know, “I’m not the typical model for this job,” and they’re not brave enough to go quit it yet. If somebody feels like they’re not the typical mold, what next step would you recommend to somebody who’s experiencing what you were? Dave Stachowiak: [00:15:05] Well, I think a lot about leadership, of course, and so one of the things that really worked for me, I don’t know if I would’ve done that on my own, Lisa. My president at the time really challenged me on that, and he was the one who took the lead initially on that. I think it’s really cool when people do that for themselves, and I’m also conscious of the fact that not every organization, not every leader is supportive of that, so I’m a big believer in testing things, trying things out. [00:15:27] So if you’re doing something one way, let’s just use sales as an example since that’s the world I grew up in and going to Carnegie. If you’re doing one sales activity and it’s not working, certainly if your organization has that as a requirement and that’s the way they need to do business, keep doing it. But test something else out. So take a half hour a day and try something out differently. [00:15:50] If you want to write, take a half hour to write. And if your organization isn’t going to like you do that, put in an extra half hour of work off the clock, and try something that’s a little bit different that’s a little bit more innovative. I think anytime we’re trying to challenge the status quo or do something different in our careers, we’ve gotta be willing to put in a little extra effort. [00:16:40] Of course, every time, someone says, “Well, yeah. Oh, you’re getting good results? Good.” Now the challenge is a lot of times people don’t think to do that. What they do is they say, “Well, I’d like to do this differently,” but they don’t have any evidence to support it, so I think that it’s incumbent upon us, if we’re trying to do something different, if we’re trying to be creative, you go try it first. Get some results that show that what you’re doing is going to make sense for the company to invest time into doing. That is a strong case for being able to do it more, and then you present it, get approval from the people you need to. But I think we have to take that step first, if we want to do something different in our career. Lisa Cummings: [00:17:16] I love that. And on the other side of your example you mentioned the selling part and how you came about that with an innovative way. And in the other example you gave was coming up with the one-on-one model that didn’t even exist. And so the way I look at this through a job shaping is if you’re coming up with something the company has never even done, and you’re going to put in extra hours to do it, I’m totally with you, sometimes you have to put in the extra time. [00:17:43] But you do it and you’re doing it thinking about, “What’s going to put me in my zone of genius?” then you’re going to be pretty energized by that thing you’re creating. So it’s not like it’s going to be the last slog of the day. You’re going to be pretty excited about that 30 minutes, and you’re not going to want to switch over to the other way because you’re so psyched about what you’re about to create, so I like the energizing part of it, too. Dave Stachowiak: [00:18:04] Yeah, indeed. I remember I spent a lot of time on that at the time, and we actually don’t do it anymore which is sort of another interesting part of the story. I developed talents in doing other areas so well that I actually went back to doing more the traditional parts of our business eventually, but it wasn’t like work. It was, “How can I do this in such a way that’s going to really leverage my talents, help the organization be successful, get everyone else on board, because we got a team of people that didn’t know about coaching at the time.” And so it was really fun. Lisa Cummings: [00:18:30] Well, you used that today. I know using your Relator talent, and you had these really deep relationships with your Leadership Academy members. Given that, if we switched gears and fast forward to today, I would love the listeners to learn from what you hear because you have these really deep one-on-one relationships with a bunch of senior leaders, and you get to have those interactions every day. So, just in general, what have you learned by marinating constantly in these interactions with senior leaders? Dave Stachowiak: [00:18:59] How much we all want to be noticed. That’s one of the biggest things I see again and again. How much I want to be noticed, how much so many of us are alike as different as we looked, as different as our experiences are, as different industries that many leaders are in, the situations that we find ourselves in. [00:19:19] We get in Academy sessions a couple of times a month with our members, and it’s so surprising, I mean, it’s not surprising to me anymore. But initially we’d have someone who was in Paris, who was telling us about a situation, and we’ve got someone else in Texas and someone else in Toronto who’s literally dealing with the same thing or had the same thing come up last week, or is about to run into this same thing. We’re so much alike. [00:19:40] And also I keep getting hit smack in the face with the reality that leadership is a really lonely pursuit in a lot of ways. If you’re a leader in an organization, even if you’re not the top person, you’re responsible for making a lot of decisions, you have to navigate the internal politics of the organization. So it’s not like you can sit around and talk with a bunch of people internally in the organization, and talk through all the things you might do or might not do. [00:20:02] You can do that with some people, sometimes, and I think it’s really helpful to have those relationships internally. But it is, it is a lonely pursuit in a lot of ways, especially the higher up you go in an organization. That’s something I hear again and again and again from our Academy members. That’s one of the reasons the Academy is there, is to create the space where leaders be able to develop relationships with each other, where they can support each other, give confidence and give encouragement, because it is really a difficult thing to be an effective leader. [00:20:54] And, wow, that really backs up what you’re saying because you’re not, as a leader, going to model that behavior and go bellyache about the things you’re struggling with in front of other people, so you keep it to yourself, and it can make it lonely. [00:21:07] I feel two really strong angles here. So, one, I’m hearing it’s lonely, and the leader is going to want to be seen and needs that tribe or those relationships so that it’s not such a lonely endeavor because you don’t have to sow all this on your own. And then the very first part of the answer that people just want to be seen. Instantly my mind went to the almost desperation in people to be seen, be heard, be appreciated, be listened to, even if you don’t have the answer they want to hear, but just knowing that you care enough to hear them out, or listen deeply. [00:21:42] So if you take that angle, I’m talking all the time to people about notice what works to get more of what works because if you can notice and recognize someone it’s a repeatable behavior, they know how to do that again. But I think you’re going beyond recognition and you’re talking about really helping people feel seen and heard. What do you find as one or two things that leaders end up doing to help people feel totally seen, heard, appreciated? Dave Stachowiak: [00:22:09] It’s one of those things that they care about doing a really good job as a leader so they’re already thinking about those things. What they run into is, “How do I get it all done in a day, where I’ve not only need to do that but I have to answer to an organization that has very aggressive timelines and schedules, and metrics that I need to hit, and keep customers happy, keep suppliers happy, executive team and all those important stakeholders. [00:22:35] The leaders that I think of in our Academy who are really, really talented at doing this, meet twice a month for an hour and a half, to give feedback and to coach each other within their teams. They are very diligent about making the space for that to happen. And those weekly one-on-ones happen, or maybe it’s a monthly one-on-one’s, or whatever is appropriate for them and their team. All of the sudden, some really great things start to come out of those conversations and relationships. [00:23:01] And I think that’s something that I’ve seen again and again is often the difference-maker between leaders that are doing the things you’re talking about, which is making that time and giving recognition and understanding what’s happening with people. And those that maybe intend well to do those things, but in practice aren’t doing those things nearly as much as they’d like to be. Lisa Cummings: [00:23:23] What a bookend, where you start off the show with your dual use of things, and now we’re ending with a dual use of openness, because it’s not just openness in your calendar for your team. It’s openness in your heart and mind as well, and I love that dual unraveling that happens for them where they realize, “Oh, gosh, it’s not just making openness in my own time so I can grow as a leader, but I have to open this up so the team can get the same from me.” That’s big stuff. That really does reflect the leadership journey so well. Just when you think, “Oh, yes, I hit the next step. I’m doing something great,” then you realize, “Oh, so much more reveals itself that I need to learn. Dave Stachowiak: [00:24:34] The importance of starting. So let me say more about that. My natural tendency as a person is to have things really figured out. I tend to be very attention to detail oriented, I’m very much a planner, the Futuristic talent that I have works against me sometimes because I like to think about, “How should it work and how should it be?” and have it all planned out perfectly. [00:25:32] And that quote, for me, very much captures what I think is really important not only for leadership, but being successful in your career, is if you’d wait until you got things 80 or 90 or 100% figured out, which is what I used to do, I found that I never started anything. Or if I’d start things I get very quickly caught up in the, “Oh, this isn’t perfect. That isn’t perfect,” and I miss the big picture of things that I really should’ve been focused on. [00:25:55] Today, I really work on letting go of some of that control. I find something that I think will be valuable or I test an idea and I go with it. And with our Academy, a lot of times we’ll test things, we’ll try something, we’ll go with it. If it works, great we’ll keep doing it, we’ll make it better. If it doesn’t work we set it aside and it’s a lesson learned. [00:26:13] For me, it’s been very much a process of just getting used to starting a lot, continually starting, continually refining, continually making things better, but not getting hung up on getting it all figured out at the beginning, because you’ll never have it all figured out. Lisa Cummings: [00:26:26] Oh so true. And what a good metaphor for how life works. You just start and then you adjust along the way, and I think people are going to want to start listening to your show. If you don’t already, you’ll want to, I’m telling you. It’s called Coaching for Leaders. So I know you’re a podcast listener because you’re hearing this, so go to your player and check out Coaching for Leaders. And where else should they go, Dave, to check out more of your content? Dave Stachowiak: [00:26:50] Oh, that’s a great place to start. Probably the other place to start is to just go to CoachingforLeaders.com. There’s a free membership setup there that gives access to our whole library of episodes for the last six years now that the shows been going on. And, in addition, there’s a free membership there where you can setup access to a free course that I offer, that’s called Ten Ways to Empower the People You Lead. It’s a 10-minute a day audio course, and it’ll give you a lot of the tips and lessons that I’ve learned myself, and from the expert guests over the last six years on the show. Lisa Cummings: [00:27:23] And thanks for making it bite-sized, yes. Dave Stachowiak: [00:27:27] I love bite size. Lisa Cummings: [00:27:28] Me too. Dave Stachowiak: [00:27:29] Start it, right? Rather than four hours, 10 minutes. Makes it easy. Lisa Cummings: [00:27:33] Exactly. And a combination of both of us spending a lot of years in the learning and development field, if you make it too big and hairy, people are going to go do it. Lisa Cummings: [00:27:41] Between Coaching For Leaders and those resources, you’ll get so many ideas for helping your team feel seen, and helping you extend along your leadership journey. 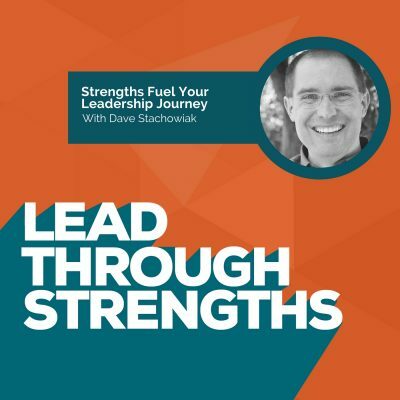 [00:28:04] With that, thanks everyone for listening to Lead Through Strengths. Remember, using your strengths, your personal natural talents, makes you a stronger performer at work. If you’ve been putting a lopsided focus on fixing your weaknesses, you’re choosing the path of most resistance. So claim your talents and share them with the world.